I’m sitting and writing this post with all the effects of eating a wonderful bowl of fragrant, hot, sour and salty tom yum soup. Tissues at the ready, hiccups from the chillies. And loving it. My family all love Thailand and Thai food, a legacy of one of my sisters living in Bangkok for a couple of years. I received a kaffir lime tree for my birthday a few years back. It is popular with my family, neighbours and friends when they are making Thai food. Just the smell of the leaves is transporting. Back to Thailand in an instant. Anyway, recent events led me to making the soup, which I have never done before. I had been in the city for a couple of days and dropped into Supercharger for lunch. They have a tom yum soup that is just delicious and I decided I must make some. 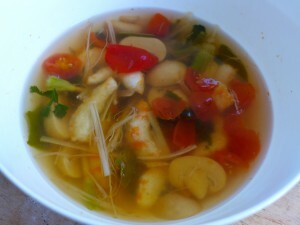 As luck would have it, that night I watched an episode of David Thompson’s Thai Street Food and he was making Tom Yum. I had no idea it was so easy to make. I learned that ‘tom’ means to boil in Thai, and that’s exactly what the soup is. Stock boiled with aromatic herbs and some vegetables. The classic tom yum in Thailand often has prawns and straw mushrooms. I happened to have some mock vegan prawns in the freezer from Vincent’s Vegetarian so I used them along with some canned champignons. You could put any vegetables or tofu in it, the soup is the star. It is easy to make and utterly delicious. Perfect for something light after all that holiday excess. Just go and make some! 1-2 cups of cubed tofu, "prawns", mushrooms or whatever you want in the soup. Boil the stock, sugar, salt, tomatoes and dried chillies until the tomatoes soften. In a mortar and pestle (or with a heavy knife on a board if you don't have one) bruise the lemongrass, coriander roots, kaffir lime leaves, fresh chillies and galangal. Add the bruised herbs to the soup and cook for a minute or two. Add the vegetables, prawns and tofu with the tamarind paste and cook for another minute or two. Put the soup into a serving bowl. Add the seasonings bit by bit, tasting and adjusting. The soup should be hot, sour and salty with no one flavour dominating.